We've seen them popping up all over the web for over a year now; video clips from a German movie involving Hitler freaking out in his bunker. These videos have been outfitted with humorously disassociated subtitles. There are so many different instances of this gag, you could spend a lifetime watching them all. Actually, I don't know if that's true... at all, but there are a lot of them. Many of these videos are quite funny... others are kinda lame. 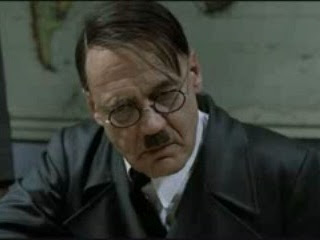 Hitler has grown awfully tired of these subtitled videos of him freaking out in his bunker. But like it or not, there's one more, and Hitler is quite enraged by this. Here is that video.